When I was doing my research for The Richest Man in Town, I uncovered only four women who qualified as the richest self-made person in their town, and I visited the 100 largest towns in America. It wasn’t exactly a ringing endorsement that women were shattering the glass ceiling of wealth creation, but it certainly proved that a new day was dawning—that women were finally and deservingly reaching the financial stratosphere of self-made success. More important, while the richest person in town might have most often been a man, in many towns, the second or third most successful person was indeed a woman. It signaled that a shift in the success landscape was fast approaching, and I believe we are going to see this phenomenon snowball over this coming decade. The decade of the woman is upon us. No one exemplifies this trend more than the sui generis Lynn Tilton; America’s preeminent business turnaround artist. There are only three self-made female billionaires in America, and Tilton in one of them. She is in good company with Oprah Winfrey, and California gubernatorial candidate and former eBay CEO, Meg Whitman. The way in which they made their fortunes are vastly different, however. Oprah built “Oprah Inc.”, a franchise based on her TV fame. Meg was the consumer products expert and compassionate corporate CEO who saw the potential in Pierre Omidyar’s desire to create an on-line marketplace for collectibles—like his Pez dispensers–and took it from 30 employees and $4 million in revenue to 15,000 employees and $8 billion in revenues. Lynn Tilton, while planning to retire at age 40, after 18 grueling years as a juggling, struggling single mother working 100 hour weeks on Wall Street says, “I had a calling to save American jobs.” Ten years ago, rather than retire to the island she had bought in order to pursue her passion for poetry, Tilton used the $10 million she had saved over her years of working at Wall Street institutions like Goldman Sachs, Morgan Stanley, and Merrill Lynch and began her mission to save distressed companies, and by doing so, save American jobs. Over these short ten years, her $7 billion private equity firm, Patriarch Partners, has rescued more than 150 companies, and has saved over 250,000 jobs. In my book, that makes her an American hero. Companies like Spiegel, MD Helicopters, American LaFrance, Old Town Fuel and Fiber, and Stila Cosmetics are just a few examples of the 74 companies that are currently under her tutelage representing 120,000 jobs, even in what is too often referred to as “The Great Recession.” There is nothing “great” about being unemployed for the 13 million Americans who have lost their jobs during this economic crisis, nor is there anything comforting to the 30 million Americans currently out of work, who see little hope for their futures. We need more Lynn Tiltons, and we need them now. The only thing that guarantees a turnaround of the American economy, is the resurrection of American jobs, particularly in the hard hit manufacturing sector. I hope Tilton’s story is an inspiration for other young women to take up such a noble cause, and that I will soon be able to write a book entitled,The Richest Woman in Town. 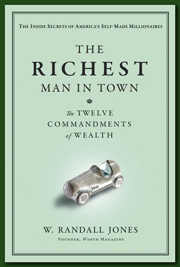 W. Randall Jones is the author of The Richest Man in Town. Visit the About W. Randall Jones and About The Richest Man in Town pages to learn more. « Where do the Rich Live?